Freemasonry Lodges in Peterborough, with assistance from the Provincial Grand Charity, have raised the magnificent sum of £27,500. This has helped cut cancer treatment waiting times in Peterborough and district. PCTA had recently appealed for funds for a new computer-aided technique which improves the accuracy of radiotherapy treatment. This significant help has enabled them to complete their fundraising and have the equipment commissioned much earlier than would have otherwise been the case. 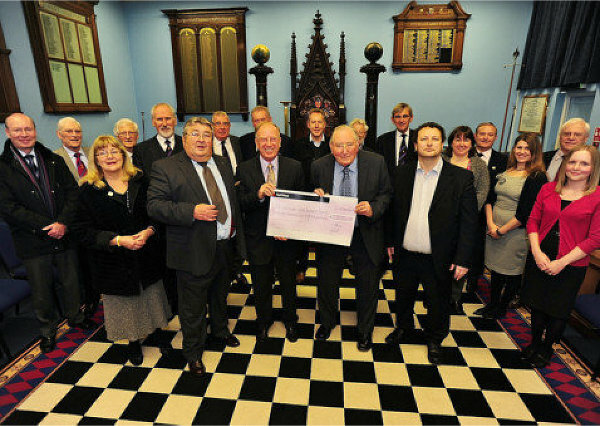 In a ceremony at the Peterborough Masonic Centre in December 2013 the Deputy Provincial Grand Master, VW Bro Dr Vivian Thomas, presented the cheque to Keith Fisher, the former Chairman of the PCTA. The Peterborough Cancer Treatment Appeal is a Charitable Company limited by guarantee. The Peterborough Cancer Treatment Appeal is registered with the Charity Commission. How about making a simple online donation?